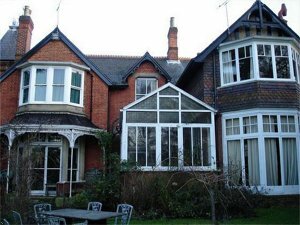 Heatherbank is a large Victorian house set in its own grounds, situated in the heart of Camberley and offers spacious, high quality bed and breakfast accommodation. There are two large double rooms, two single-twin rooms and a twin-triple room. There are also two serviced-self catering fully furnished apartments available. TV, DVD, digital receiver and tea-coffee facilities provided in all rooms. Parking is available within the grounds. Camberley train station and the town centre is within walking distance (8-10 minutes). Within easy reach of the M3. Check in between 5pm and 10pm. Moderate single Single room with separate bathroom facilities. The bathroom is large with a separate bath and shower. Moderate twin A twin room located on the ground floor looking out onto the conservatory. Use of large bathroom with separate victorian bath and shower. Moderate double Large double room with TV, DVD, digital receiver and tea/coffee making facilities. Use of shared bathroom with bath and separate shower cubicle. Ground floor single Single room located on the ground floor. Shared bathroom facilities are next door to the room. From M3 (J3)- At roundabout follow signs to Bracknell-Ascot (A322). Go straight across at traffic lights and then take slip road signposted Camberley (A30). Go straight across 2 sets of traffic lights and continue up the hill to another set of traffic lights (American Golf shop facing you). Go straight over lights onto A325. At next roundabout take fourth exit into Crawley Hill (signposted St Pauls Church). Continue along this road and over a hill, past St Pauls church on the right and Belton Road on the left. Drive on for a further 75 yards and then turn right into Heatherbank drive (immediately opposite Bellever Hill) and park in the grounds. The entrance is on the right hand side. Please ring the top two buzzers.